If you were to mention the period of time around June 1972 to a random group of people the normal response would be that this was the month of the Watergate break in. An event that would in two long years eventually force the resignation of President Richard Milhous Nixon. There have been many books and movies made about this event and the related events that followed. However to Chevrolet muscle car fans, the June/July 1972 time frame also signaled the end of Chevrolet’s bread and butter muscle car. 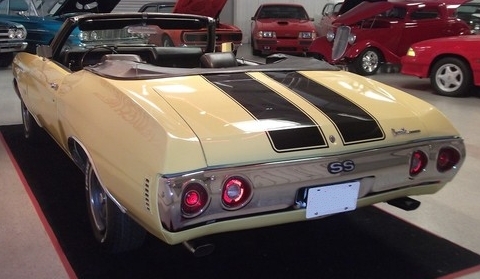 During this small period of time production ceased on the last genuine Chevelle SS. Yes indeed the 1972 model would be the last of the brute Chevelle SSs. The Chevelle SS did live another year on GM’s all-new mid-sized colonnade A-body platform however it was a paper tiger. The 1973 had new semi-fastback styling and an interesting array of features however it had gained a few hundred pounds and some overall girth. The 1973-1977 Chevelle would be the largest Chevrolet A-body thereby making the 2-door version a heavy car with full-size car proportions with much lower power engines. It was a bad combination for any muscle car fan. For 1973 the mighty Chevrolet big-block 454 CID V8 which was still a Chevelle SS option, was down to 245 net horsepower. To add insult to this injury the 1973 Chevrolet Corvette’s optional small-block LT-1 350 CID V8 produced 250 net horsepower and its optional big-block 454 V8 produced 275 net horsepower. This was a big step down for the Chevelle SS which back in 1970 had the highest factory rated muscle car era Chevrolet motor on its option list – the 450 gross horsepower LS6 454 V8. The LS6 was not a Corvette option in 1970 – the 390 gross horsepower LS5 454 V8 was as good as it got for the Corvette that year. 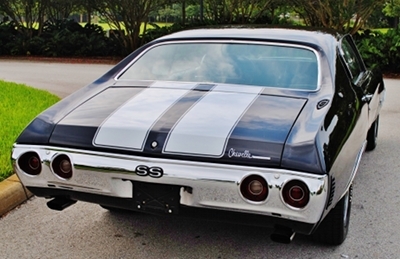 The Corvette outgunning the Chevelle SS for 1973 was indeed another sign the Chevelle SS was on its way to extinction. 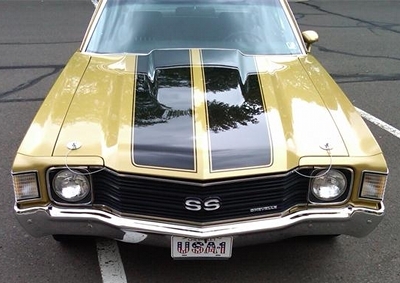 In 1974 when the Chevelle SS didn’t return, the Chevelle Laguna S3 was its replacement which was more a graphics package than a performance package. The Chevelle SS never returned to the Chevrolet lineup. Quick rewind back to the 1972 model year, all was still good with Chevrolet’s bread and butter muscle car, the Chevelle SS had a familiar shape first seen on the 1968 model and had been tastefully updated each model year. By 1972, all the charm was still there. Even the evolution to twin headlamps (from four) for 1971-1972 was an appealing change along with the 1971-1972’s round rear taillights tastefully imbedded in the rear bumper made the Chevelle look like the Corvette’s respectable older brother. The overall shape of the 1972 Chevelle defined what a muscle car should look like. It had a wide stance, a long hood, and a short decklid. And even though muscle cars on the average were seeing heavy sales drops, the Chevelle SS with 24,946 produced for 1972 surely proved it still was popular. As a comparison the Pontiac GTO which had started the muscle car craze in 1964, by 1972 was also still a very attractive muscle car that also provided plenty of power under the hood, but only had sales of 5,807 units. The SS was standard with a sporty hood with hood pins. 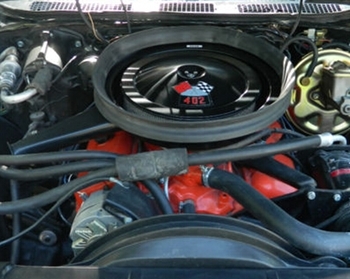 The (ZL2) cowl induction hood which forced air into the Chevelle SS’s engine via the air cleaner assembly, was still on the option list but could only be ordered with a Turbo-Jet V8 – the 454 or 400 (in Chevrolet sales literature the LS5 was called the Turbo-Jet 454 and the LS3 was called the Turbo-Jet 400 – for some odd reason Chevy liked to refer to the 402 V8 as the Turbo-Jet 400 which was confusing since Chevrolet during this time also produced a small-block 400 CID V8). With the cowl induction hood option, hood and trunk stripes were standard. The hood and trunk stripes could also be ordered as an option on the SS with the standard hood. The cowl induction hood by 1972 was losing its popularity a majority of 454 and 400 V8 powered 1972 Chevelle SSs had the standard hood. Another step backwards for 1972 was the 454 and 402 were now both stuck with orange painted valve covers, the chrome valve covers which were once a Chevelle SS standard item were now gone. Don’t let the Chevelle SS name fool you, for 1972 (just like 1971), the Chevelle SS was no longer a separate model but the Z15 option on the 2-door Malibu coupe and convertible. The "Heavy Chevy" option package which was a stripped down lower powered version of the Chevelle SS was actually a Chevelle option. Horsepower was down across the board on paper, however when the big-block 454 and 402 CID V8s were ordered, plenty of punch was still there. The top dog motor for the 1972 Chevelle was the LS5 454 rated at 270 horsepower which was the same spec LS5 that was the top horsepower motor in the 1973 Corvette. Horsepower appeared to be still good but better yet the LS5’s torque was rated at a mighty 390 lb-ft. Horsepower figures on the surface can be misleading. For the 1972 LS5 was the same exact spec LS5 found in the 1971 Chevelle SS which produced 365 gross horsepower and 465 lb-ft of torque. However it wasn’t a simple loss of 95 horsepower as it appeared on paper. There really was no horsepower loss at all. The culprit was the new for 1972 SAE net horsepower ratings which happened to be more stringent than the years beforehand in which horsepower was measured in the more lax gross ratings. The LS5 moved the Chevelle SS through the 1/4 mile in mid-14 second range, which was traditionally respectable muscle car territory. And there was more good news, 1972 Chevelle SS also had on the option list the LS3 402 V8 which was rated at 240 net horsepower and 345 lb-ft of torque was the same spec optional motor found in the 1971 Chevelle SS, where it was rated at 300 gross horsepower. So no real performance ground was lost when the LS5 454 and 402 were ordered. However there was some bad news, the 1971 Chevelle’s 425 net horsepower LS6 454 never made it to 1972. A 175 net horsepower small-block 4-bbl equipped 350 CID V8 was also on the option list for the 1972 Chevelle SS. Unfortunately as a sign of the changing times and the dawn of the new era of the emerging performance paper tiger cars which would go into full swing by the mid to late-1970s, the 1972 Chevelle SS also had a 2-bbl 350 V8 rated at 165 horsepower on the option list. The really bad news for 1972, was a 130 net horsepower 2-bbl 307 CID was now a Chevelle SS engine option. A few years beforehand this would have been unthinkable that such a low powered and low displacement V8 would have been available in the Chevelle SS. From 1965 to 1970, the Chevelle SS could only be equipped with Chevrolet’s big-block V8s. The paltry 2-bbl 307 V8 was a slap in the face to all Chevelle SS fans. As a comparison the 1972 GTO had as its base motor a 250 horsepower 4-bbl 400 CID V8 (top option was a 455 HO V8 rated at 300 net horsepower). Though according to 1972 Chevrolet sales literature, the 307 V8 was a Chevelle SS option, very few were produced. So few in fact that many Chevrolet fans believe that none were produced, it’s a sore subject among many Chevelle SS fans who populate both sides of the debate centered on the existence of a factory produced 1972 Chevelle SS 307. A few original 307 powered 1972 Chevelle SSs have surfaced over the years confirming the 307 V8 could be ordered with the SS (Z15) option. The extremely low numbers were a good sign that Chevelle SS buyers at least were wise enough not to opt for the anemic 307. However due to the 307 powered Chevelle SS being such an odd rarity, today it would make the perfect collector car. 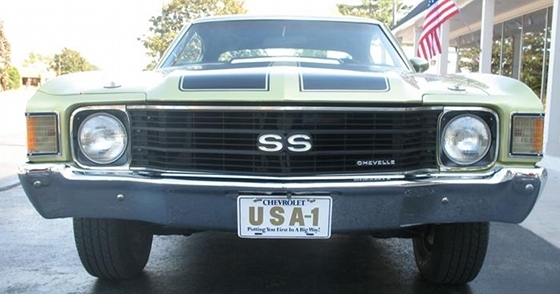 As far as transmission choices went, the 3-speed manual was available with all the SS’s V8s except for the 454. A Turbo Hydra-Matic 3-speed automatic was also available with all the SS’s V8s. And in a strange twist, buyers could order a PowerGlide 2-speed automatic transmission on the 307 only – not sure why anyone would have preferred the outdated PowerGlide over the more modern Turbo Hydra-Matic. When an automatic transmission was ordered with the center console a very attractive console shifter was standard – it looked just like a jetliner throttle lever. And if a 4-speed manual transmission was desired it could be ordered with both 350s, the 402, and 454. No matter what engine was ordered, all 1972 Chevelle SSs came equipped with standard power front disc and rear drum brakes. A set of stylish 15 x 7 inch sport wheels with performance F60 x 15 Goodyear tires were also standard. A left hand side remote control chrome mirror was standard and a chrome mirror on the right side was optional. The body colored side sport mirror could be ordered on the left side only or on both the left and right side – when ordered on both sides these sport mirrors gave the SS a more refined look. 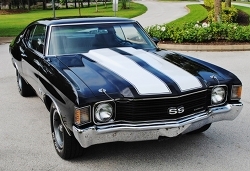 By 1972, the Chevelle SS had become a good handling car. The finely tuned handling suspension which had the RPO code of F41, by 1971 had become standard for all Chevelle SSs. The 1972 SS also was standard with the F41 suspension. The previously mentioned 15 inch wheels were part of the standard F41 package along with a rear stabilizer bar, heavy duty shocks, and performance oriented springs. 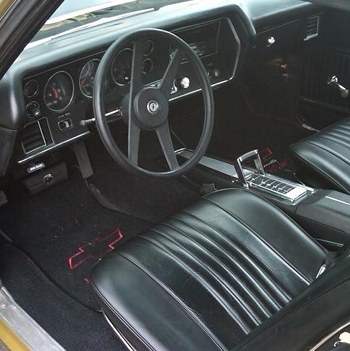 The interior of the Chevelle SS was plain with no real flash to speak of, but it was functional. Round sporty gauges were standard on the SS, however to obtain a tach a buyer had to order the optional round gauge package which included a coolant temp gauge and a few other gauges. Seats were also basic but comfortable for their day especially when the SS was equipped with bucket seats. And there were plenty of options available to load up a Chevelle SS – such as power windows, power door locks, and a tilt steering wheel. Most muscle car fans back in June/July 1972 were probably not focused on the end of 1972 Chevelle SS production, in the same way most people during those two months weren’t focused on the Watergate scandal. As time would pass the Watergate scandal would gain the attention of the American people and force the first resignation of a U.S. President. And as time would pass muscle car fans would soon realize when the 1972 Chevelle SS ceased production it was truly an end to an era. These fans discovered a few years after 1972 that Chevrolet’s beloved mid-sized large displacement muscle car was gone. It would return in spirit with the 180 horsepower 5.0 liter H.O. V8 powered 1983-1988 Chevrolet Monte Carlo SS, but the real thing in the form of a production large displacement V8 powered genuine Chevrolet muscle car was gone after 1972. The LS5 powered 1972 Chevelle SS which only 5333 were produced defined the end. Just as the American people still feel the pain and aftereffects of the Watergate scandal forty years after the fact, muscle car fans have suffered the same type of wounds with the death of the last genuine Chevelle SS in 1972.